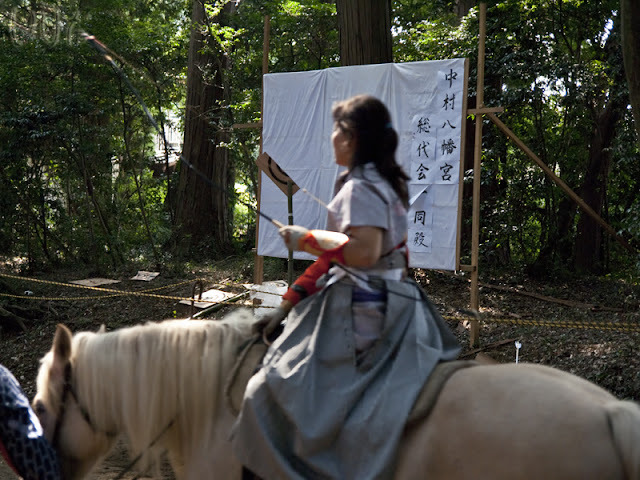 What we can see at the Rei Taisai festival? In this entry we’re going to talk about... you guessed it... Yabusame. At present, Yabusame (流鏑馬) is a ritual ceremony, which takes place on shrine grounds during special occasions. 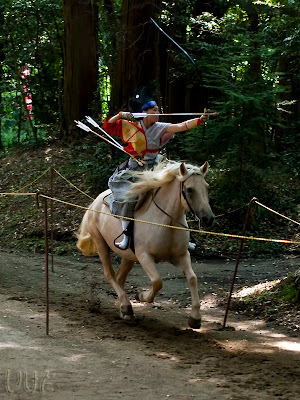 However, in the past it was meant to be a training exercise to master the skills of traditional Japanese mounted archery that were vital among the samurai. Well, at least among those who wanted to survive their first battle. 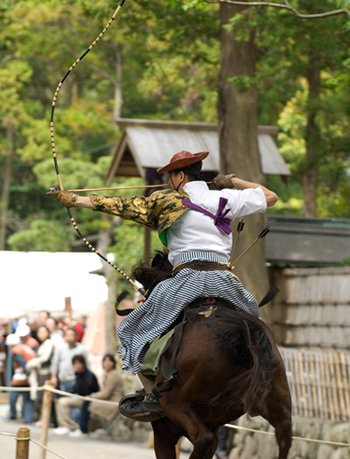 Dressed in traditional fashion, an archer on a running sacred horse shoots Kaburaya - a signal arrow, or whistling-bulb arrow (鏑矢). “Kabu” literally translates to “turnip” (カブ) and “ya” (矢) is an arrow. A certain type of Kaburaya, called “Hikime Kabura” (蟇目鏑), that has four pierced holes in its “turnip”-shaped head, is really a “whistling”-bulb arrow. While shot into the air, the air goes through the holes, and that makes Hikime Kabura whistle. It’s like shooting a pipe in the air! The sound is believed to purify the place by getting rid of evil spirits. As you can see, these arrows are not a tactical weapon, rather it’s a ritual sign, kind of like a blank salute at a military ceremony. You can see the "turnip" shaped tip here, though this is just an ordinary yabusame arrow, and not the whistling kind. In the 10th century, based on Chu-yu ki (中右記), an account written by Udaijin (右大臣) - Minister of the Right - Munetada FUJIWARA (藤原宗忠), Yabusame was indeed described as a practical tactic. During the late Heian and Kamakura era, war was one of the opportunities for samurai to show their honor (self-assertion, in other words) where they had one-to-one and hand-to-hand (or rather, sword-to-sword) fights. It started off by self-introduction (say your name, title, affiliation, name of your lord, and so on) and shouting all of it out loud while riding the horse towards your enemy. No strategic idea existed in combat, as a whole. Later on, when the style of battle was transformed from a bunch of individual fights into a complex battalion led by a supreme commander staying at HQ (headquarters) that was a long way from the front lines, an individual samurai (soldier) was forced to act like one of the pieces in a chess game (mostly a pawn, sadly). Since then, individual combat skills were not as indispensable as before. Yabusame has lost its practical significance, and then became solely a ritual for self-discipline. What happened next was the “formulation” of the whole procedure, which was conducted, in large, by two schools; one is the Ogasaware school (小笠原流) and the other was instituted by Yoshiari MINAMOTO under the Imperial order of Uda (宇多天皇). It is recognized as the Takeda school (武田流) of archery. In the mid Edo period, when there was no warfare going on, the 8th Tokugawa Shogun, Yoshimune TOKUGAWA (徳川吉宗), encouraged samurai to improve their martial arts. And Yabusame, which was outdated by then, was also integrated in his “must-learn-how-to-do-things” list. - Ayaigasa (綾藺笠), made of Igusa (イグサ) - soft rush (juncos effuses) on your head - you can see the traditional hat in the photo above. - it is quite normal for the archer to scream while shooting (as you can see in our YouTube video below). I am afraid that you’ll have to suffer once again through the war in which Yoshitsune (義経) was indirectly killed by his half-brother Yoritomo (頼朝). This war is called “Oshu Seibatsu (奥州征伐) = conquering Mutsu province”. Yoritomo was the Commander in chief of the battle. See this post, if you want to know more. When Yoritomo MINAMOTO stopped at Nakamura Hachimangu to pray for triumph in battle, the rural lord of the Nakamura district in Shimotsuke Province, Munemura NAKAMURA (中村宗村), joined Yoritomo’s army. Yes, the name of district is the same as the family name of the lord. Since Munemura contributed to the victory in the battle for Mutsu Province, as a reward he was appointed to the position called Jito (地頭) – Medieval land steward in the Date district in Mutsu Province (currently in Fukushima Prefecture). He and his family members moved, settled there, changed last name from NAKAMURA to DATE (伊達) and became the founders of the DATE clan (伊達氏). Yes, the Date clan was founded by a bunch of Mokans, how about that? In 1736, over 600 years after Munemura’s death, his descendant, Yoshimura DATE (伊達吉村) stopped by at Nakamura Hachimangu on his way to Edo (ancient Tokyo), probably due to Sankin Kotai (参勤交代), I guess. 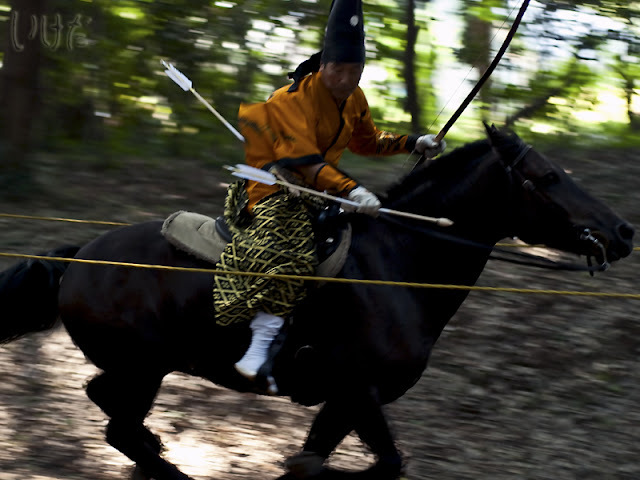 He must have respected the origin of his clan and therefore donated sacred horses to the shrine. At that was the origin of the Yabusame ceremony at Nakamura Hachimangu. Honda one horse power champion ready to go. 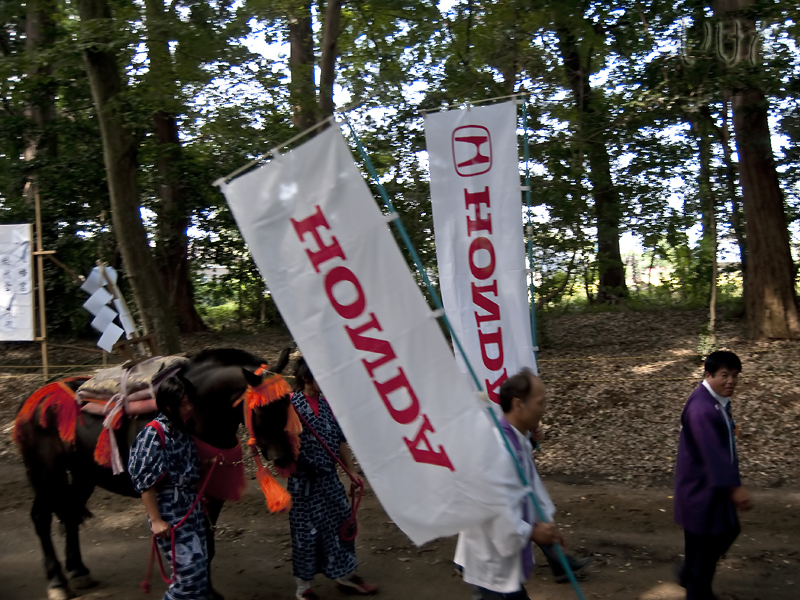 In terms of performing Yabusame, Honda - a motorcycle and automobile enterprise, always gets involved. Why Honda? Why at Nakamura Hachimangu? I’m guessing that the local Honda plant, which is very nearby, gives charitable donations to the shrine for the upkeep of horses. You know, being good neighbors and all that. Just as last year at Rei Taisai, this year we also saw the Honda-sponsored black horse (1 horse power, approx 400kg) performing Yabusame. 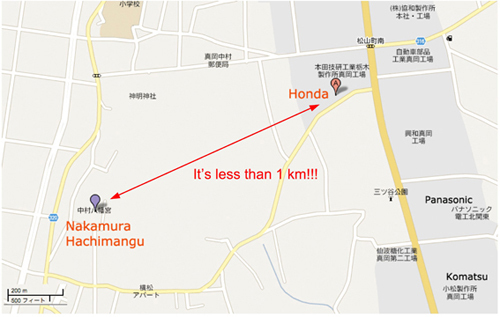 Close relationship between Nakamura Hachimangu and HONDA. They are practically next-door neighbors. Mrs. T already reviewed the skill of archers at this year’s Yabusame performance in this post and videotaped it. If you haven’t seen it already, take a look now.